We recently spoke to the race director and some locals about the upcoming 2014 Fire on the Rim mountain bike race. Sounds like it’s going to be good! The trails are dry, but not too dry, the tacky sort, perfect for a race! The race has some great sponsors this year, plenty of good food and beer for all! 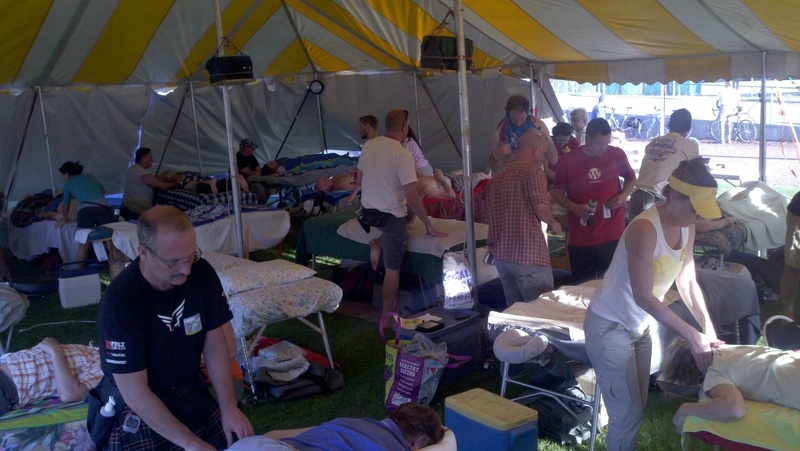 Flagstaff Sports Massage will be down again this year to provide sport specific massage therapy. As a side note: Why we do it. Because we love it. We bike. We support the race community and the fundraising. We take our kids out to the events so they experience the culture; they ride, they race, although they are young and still doing the kid races, they have a blast in the community! We make a little money, we hope to pay our vendor fee. 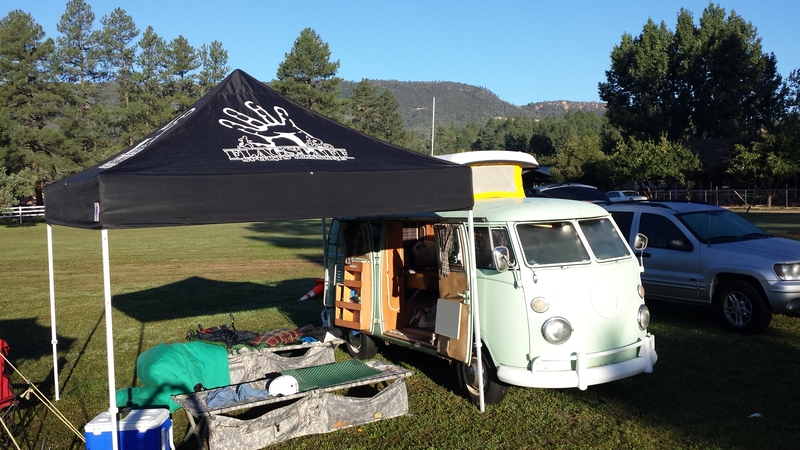 We roll out one of our vintage camp trailer, and maybe an old VW split bus. This year I think we will bake some cookies. We like the music, the food and the great outdoors. Over the years we have built many awesome relationships with you. We always love coming out to the races, you understand. See you in the tall pines! 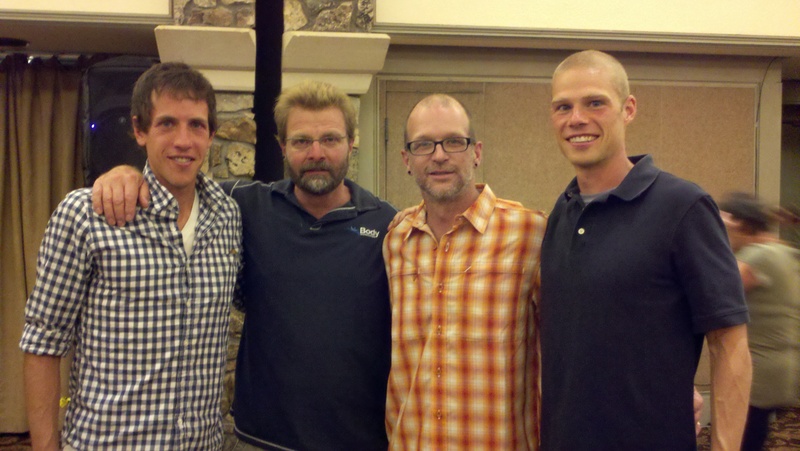 Flagstaff Sports Massage will once again have a clinic at the Phoenix/Tempe Airport Springhill Suites November 18th and 19th from 7am to 10pm in preparation for Ironman AZ 2011. To book your therapy contact Geoffrey at 928-699-1999 or staytunedaz@gmail.com. Sessions will be available in 30 minute and 60 minute blocks. 30 min $45.00, 60min $85.00. Flagstaff Sports Massage Therapists are trained in advanced sport massage modalities, flexibility protocols, common injury prevention as well as various typical forms of deep tissue, myofascial release, trigger point & NMT. Space is limited so book early, 6 therapists available. Credit card options. 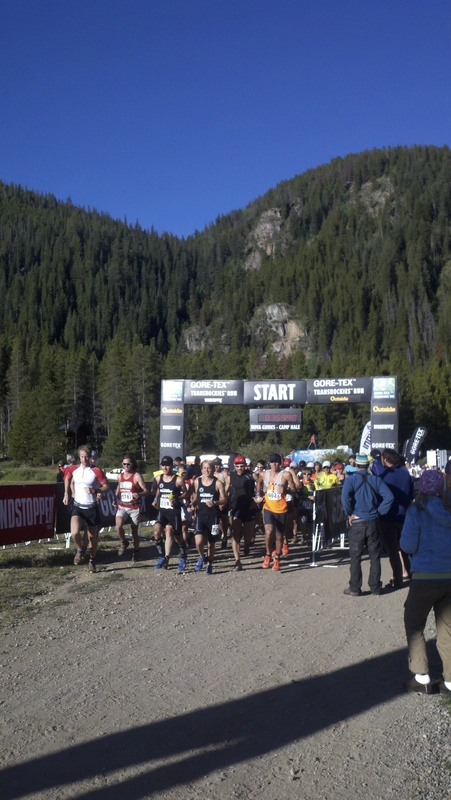 Flagstaff Sports Massage will be present at each of this years four XTERRA Trail Races. 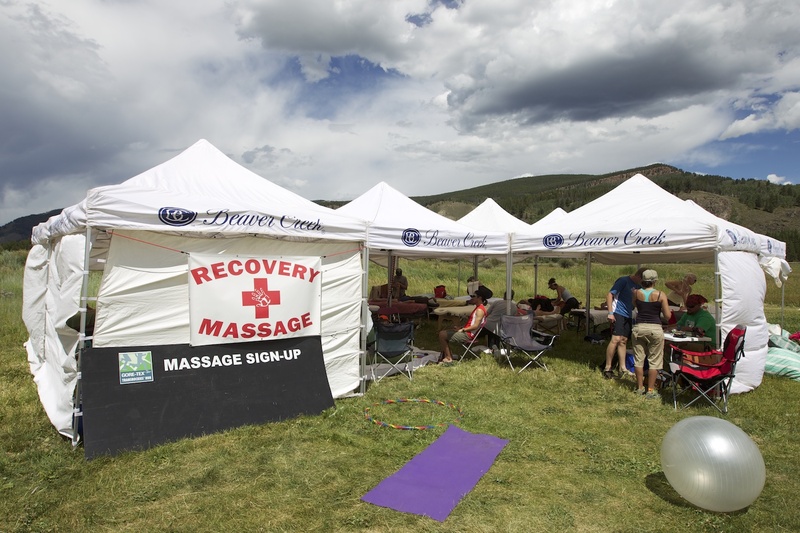 Licensed massage therapists from around the state are coming together to provide post event massage for you after the races! Sessions will be provided in 15 minute segments and you can have as many as you want. Rate per 15-minute session will be $20. These therapists are hand selected for their knowledge in sports massage, injury prevention, common injuries, and professionalism. Be sure to catch them after the race. The late, great Jim Woolway had the gift of appreciation. Always fit as a fiddle, Jim rode RAGBRAI into his seventies, usually bringing along his brother or his kids or his grandkids, who struggled to keep up with him. His daughter Laurie and grandson Jordan will be riding with PBV again this July. As we drove across Iowa early this month, looking out at the farmland, I thought of Jim and how he used to say “Every day is gravy.” He would have enjoyed scouting Iowa in spring: black dirt tinged with the green of sprouting corn, old leaning sun-bleached barns, deer grazing just before dawn, a prairie sunset reflected in a farm pond. He always loved meeting our generous hosts, tasting their pies, and sitting under their shade trees. We have done our best to put plenty of gravy into your week, Porkers, and you’ll read about that in a second. But ultimately, the real gravy comes from YOU and your ability to appreciate—like Jim did—this place, its people, its countryside, and its forces of nature. We remind ourselves (and you) to cultivate that kind of thinking. We’ve heard it called “an attitude of gratitude,” but call it “gravy thinking” if you like, just being grateful every day for the good things you find on your pilgrimage across Iowa. Gravy thinking is a cornerstone of living like a pig, and once you learn to live like a pig, you will want for nothing! The main purpose of this email is to give you the day-by-day description of our Week in the Corn. But first, a couple of important digressions. As you read through the arrangements we’ve made in each host community, please bear in mind that none of this could happen without the local volunteers, the campground committees, the willing civic leaders, and the active church members in each place. 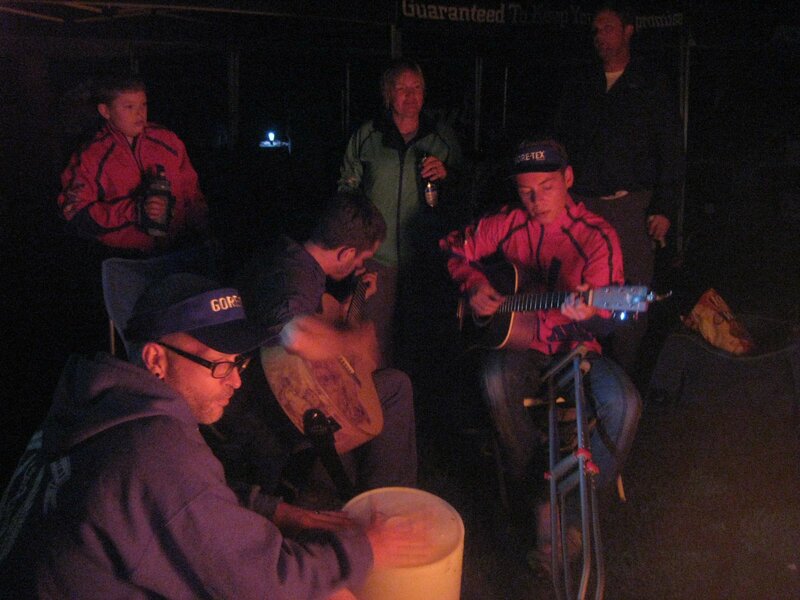 These folks take time away from their jobs and families to attend meetings, line up twelve hours of local entertainment, plan menus, pore over maps, explain logistics, and guide us around town to our amazing campsites of 2010! We’ll mention a few of these folks, and we’ll suggest ways that you can help them as you share their lovely hometowns, one after another. 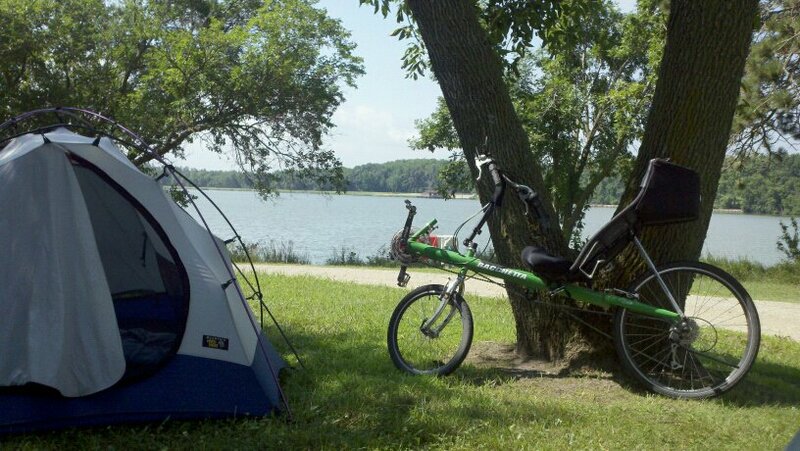 Quick lesson for you about RAGBRAI Campgrounds. Every town is different. 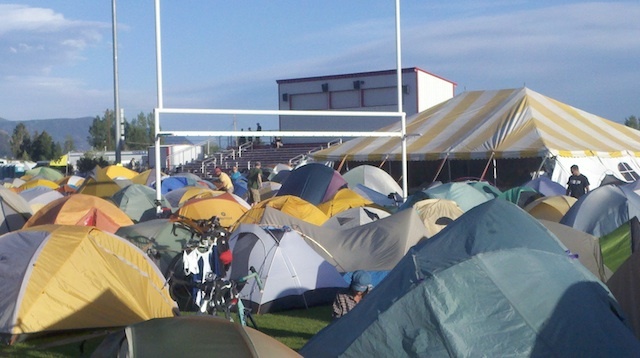 Some towns can put the whole RAGBRAI into a great big “All-in-One” area-a large park, fairgrounds, or campus. 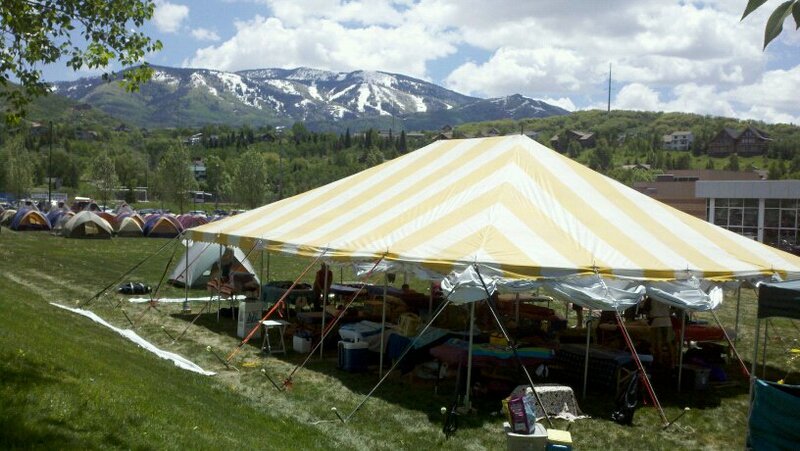 Other towns offer what we call “satellite camping,” which means lots of smaller sites at schools, athletic fields, smaller parks, and green spaces around town, with evening festivities in the town square. This year, there are more towns offering satellite camping than all-in-one camping (Clear Lake is an exception), but in most cases our sites are less than a mile from the festivities, sometimes just a few blocks away. In our February invitation letter, we did our best to describe what you could expect from us, but we’ve had a few developments since then. Rather than five licensed massage therapists working in Pork Camp, we’ll have six. Though we promised two evening meals included in our Weeklong Support, we will provide three evening meals (three dinners to which everyone on Weeklong Support is entitled). We’ll also offer one optional evening meal on Wednesday and one optional take-away breakfast on Thursday. Rather than seven days of showers during the week, you’ll be entitled to one or more showers on all eight days, and they will be located adjacent to our campsites in each spot. We mentioned that in-camp entertainment would depend on host town approval, and we will have entertainment on at least three nights, including the Elders on Tuesday and Wednesday as planned. On Monday night, there’ll be one indoor sleeping opportunity at the First Lutheran Church of Algona (we’ll let you know when we can take your indoor sleeping reservations on first-come-first-served basis). We are still at work on one or more optional hotel stays, complete with transfers to and from our camp. Please stay tuned for more Pork News as it happens. Now, without further ado, here’s your river-to-river itinerary, in some detail, starting on Iowa’s West Coast. Like last year, we’ll begin RAGBRAI in a large metro area. Sioux City, home to 86,000, is right on the Muddy Missouri River, “too thick to drink, too thin to plow,” but just right for dipping rear tires only a mile from our campsite in a large city park. Some of you will arrive at the park by bus from Omaha, others by bus from Dubuque, and still others will be dropped off by friends or family. At our campsite, you’ll check in, get shipped bikes ready to ride, hand over your bike-shipping containers for weeklong storage, and get your tents up. Everything will be easy and orderly, so don’t sweat it. We’ve done this a few times, and we’ll get you on your way to the festivities in a jiffy. The PBV Showers, free to you, are right beside us, in case you work up a sweat doing your chores. There’s a swimming pool in the park also. Sioux City has spruced up the downtown area, less than a mile from our park, and it’s a downright picturesque place to graze food venders and take in the bike expo. If last year is any indication, a bunch of you will attend the headliner Smashmouth Concert. Have a ball, but save something for Sunday morning when you’ll start pedaling east into small-town Iowa. Do any of you long-timers remember our last Storm Lake campsite, a deep piece of lakefront real estate peppered with tall shade trees? We loved it back in 2001, and we’re back in the same spot, only this July we’ll have our own hot showers and a delicious Welcome Supper served by our old friends at the Family Table. Terry, Tim, and Curt will be grilling and setting up serving tables in the afternoon. Some of you will remember their signature wine-marinated turkey filet sandwiches, complete with hot cheesy potatoes, sweet corn, pasta salad, and dessert. The Welcome Supper is included for all weeklong Porkers. We’ll host a little shindig tonight, and with the sun setting over the water, it’s going to be beautiful evening on the shore. That is, if Storm Lake doesn’t live up to its name. Again. A narrow street separates the Bertha Godfrey Elementary School and the First Lutheran Church, both of which are home to PBV tonight, and both of which offer lots of shade trees and lush grass for camping. Our showers will be located in the church parking lot, as will the kybos. Your supper tonight will be prepared by Julie Murphy, Kevin Benschoter, and the good folks of First Lutheran. A classic “church supper” menu is in the making, so try not to spoil your appetite at the church pie booth, where you’re free to sample dutch apple, cherry, rhubarb, banana crème and all the other flavors, all homemade by the church ladies, all afternoon, proceeds to the church, of course. Your dinner tonight is included for all Weeklong Porkers. Here is a place where you can help our host congregation with its technology needs by contributing in some small way. Buy a slice of pie. Pay the paltry price to sleep in a Sunday School room. Drop a few bills in the collection box. Let’s be extra kind to our Good Samaritans at First Lutheran. This is one town where much of the camping is in one spot, at the high school, and our campground chair, Ernie, has given us a lovely stretch of pristine grass between the school and a row of trees along the street. This is a very short cycling day, so after your next-door shower, plan to see what’s happening downtown-only about six blocks away. This lakeside community has a lot of cozy pubs, as well as a downtown lakeside park filled with yummy food venders. Clear Lake has done an amazing job lining up all-day, all-evening entertainment for you-they got everything from a national jet-ski competition to an evening performance by the Spin Doctors. Plan on a late lunch in downtown Clear Lake and a late supper there, too. In between, we hope you can make it back to our site for an early concert from our favorite Irish band, the Elders. Tomorrow night, they’ll be your main event, but today in Clear Lake, they’ll do a kick-arse job of warming you up for the town’s incredible bands and shows. We have a little history of Wonderful Wednesdays-knock wood-and Charles City, or “Chuck Town” as RAGBRAIers know it, will sustain that tradition. This place is on par with our campsites in Tama in ’08 and Chariton last year. Wendy, the campground chair, kindly directed us to the Charles City VFW, and counter to our usual modus operandi, we didn’t bother to look further. You know it when you see it, Porkers, and the VFW owns the prettiest park in town, with the VFW bar-and-grill building up toward the road and a deep, wide meadow with scattered trees out back. And just to carry us right over the top, a babbling brook with a quaint bridge runs along one side of the property. Our shower vender will be right along the street beside us. Ginger, the co-chair of Charles City RAGBRAI, is finding just the right menu for an optional Pork Meal this evening. She’s leaning toward a savory lasagna with yummy sides. (This meal will be optional, not included, and you’ll be invited to sign up for it at the Front Desk in Sioux City on Saturday. Menu and price to be announced.) Carry your plate out back and take a seat under the canopies for our foot-stomping, heart-lifting, ear-tickling highlight of the week. Knock wood, weather permitting, God willing, and the creek don’t rise, it is shaping up to be a gorgeous night for an Elders Concert. Naturally, as we drove toward Waterloo, we were thinking “city.” Not that it isn’t nice to have a city stay now and then, but imagine our surprise to find ourselves able spread out on a spacious farm owned by Sandy McLain. Sandy and her husband used to farm the property, but since her husband passed away, things have changed. The town has slowly crept toward her farm, and now, right across the road from her front yard is Lost Island Water Park and The Isle Casino. Her back yard, though, is a green rural paradise looking out across fields and farms. Turns out Sandy’s son is (we aren’t making this up) the owner of P.T. Grillers, whose specialty is catering outdoor barbecues. Get ready for Pork Belly Sausage Night, courtesy of Tom McLain, a very funny guy, and his happy crew of servers. Choose from Italian Sausage, Polish Sausage, or Cheddarwurst on a bun with condiments (including peppers, sauerkraut, and the usual mustard and relish), along with hot cheesy potatoes, veggie and pasta salad, and a medley of fresh fruit. This meal is included for all weeklong Porkers. Showers and kybos out front. The wet and wild theme park across the street. Supper straight off the grill. Tom Woods and the Thunderbirds playing blues on the Pork stage. Life is good. You’ve heard of the Corn Palace in Mitchell, South Dakota. No? Well, it’s listed among the most famous corn monuments in the country. And every summer, Dean Sherman, retired mail carrier, uses some kind of laser technology to create a more temporary type of corn monument. Pork Belly Ventures will occupy a large, shady city green space, and we’ll also lap over onto Dean’s property, where he grows acres and acres of pumpkins and squash and keeps a kind of artistic flower garden of barbed wire sculptures and painted wooden doors and other neat rural artifacts. His place is very pretty. But his favorite hobby-and he has a few hobbies-is growing his famous and intricate annual Corn Maze. He showed us aerial photos of the previous mazes, the spider web, the spreading tree branches, and the pumpkin. But the maze of 2010 tops them all-a locomotive pulling a coal car and a caboose. PBV has paid your admission to the maze, but how about we agree that nobody goes in without a buddy? We don’t like to think of you lost in the coal car, gnawing on raw corn until Dean harvests his crop in October. Plan on a Farewell Shindig tonight, a short walk to the downtown food venders, and if Dean can swing it, a cow-chip toss. He’s checking into the chips. Between now and July, you could put some oatmeal in a Frisbee, Porkers, and practice tossing. Manchester is going to be a real Iowa fond farewell! Sad to say, but this Saturday usually ends up being a scramble, and there’s hardly time to say goodbye. There are a whole lot of logistical details that we’ll put into the June Letter. For now, we will just say that you will be riding directly to the river for your front-tire dip, before being routed on to us at the Kerper Longterm Parking Facility. In other end-towns, you have had the option of coming to us before dipping, but not this time. So enjoy your river dip, Porkers, and don’t get lost in the party. Because it’s a short cycling day, we may have departures for Omaha as early as 1:00 p.m. Enjoy your last day, but come on over to Kerper for your bike-shipping, showering, and bus-boarding. We hope to be out of town by 2:30 p.m. Again, more to come on Saturday, the 31st. That’s it for now. We have only described campsites and activities here. You can expect instructions and directions, regarding Sioux City and Dubuque in particular, in our comprehensive June Letter, coming to you soon. Update #10 has given you an idea of what we are doing to give you the gravy and make your week in Iowa as hilarious, nourishing, and relaxing as possible. The June Letter is your chance to return the favor. If everybody reads it carefully and does what it says, you’ll make our next several weeks easy as pie, and we’ll appreciate it! Americans report more stress than last year, turning to massage for relief. Doctors strongly recommending & encouraging massage. As stress rates increase, more people are turning to massage therapy for relaxation, according to the 12th annual consumer survey conducted by the American Massage Therapy Association® (AMTA®). The survey found that 59 percent of Americans are more stressed this year than last year, and stress and relaxation are the top reasons Americans received their last massage. These survey results are announced in advance of National Massage Therapy Awareness Week, October 19-25. The state of the economy has been a major stress trigger for Americans this past year. Forty-five percent of Americans say they are greatly stressed by the current economic situation, or other factors. Younger Americans and women have felt particularly affected by the economy. Fifty-five percent of those ages 25-34 say they are greatly stressed by the economic situation, and 51 percent of females agree. Young Americans and those in lower income groups are the most likely to consider massage for stress. Fifty percent of 18-24 year olds and forty-six percent of those making less than $25,000 a year say they would considered massage to manage stress. While lower income and young Americans are more likely to seek massage for stress, people with higher incomes are more likely to discuss massage therapy with their doctors. This year, 16 percent of those making $50,000 a year or more, discussed massage with their physicians, which is nearly twice as many as those making between $25,000 and $35,000. And more than half (57 percent) of those who talked to their doctor about massage reported that their doctor strongly recommended or encouraged them to get a massage. Despite recommendations from doctors, massage therapy is not always covered in health insurance plans. Sixty percent of Americans reported that they would like to see massage covered by their insurance plans. Prolonged sitting, hip flexor tightness, overuse and misuse can all cause hip problems. Often when the “soft tissue” i.e., muscle, becomes tight the deeper layers of the connective tissue surrounding a joint will become short, stuck and glued down. The hip capsule is unique in that it has a sort of rotatory arrangement of its fibers. One commonly seen pathology, is the head of the femur (ball) becoming fixated into the posterior portion of the acetabulum (socket). A pain generator to be sure, as the bone grinds on the inside of the joint space. This may occur as a result of a dropped arch, internally rotated leg, and rotation of the femur. One way to address the issue at the hip, is to position yourself or client/patient as shown in (fig.1). This external rotation of the femur causes the head of the femur to migrate into external rotation, stretching the iliofemoral lig., which attaches the hip to the thigh and visa versa. (The one that gets all glued up during bouts of great hip flexion and approximation of muscular origin-insertion.) If you are a therapist using this technique position hands just inferior to greater trochanter. Gravity will help those who help themselves. To add an enhancer to this position, you may try pelvic tilts…tuck the tail bone under and back out. Some people may feel a bit strange about this enhancer so I recommend pushing the knee into the floor for a count of 6-8 seconds, release and repeat 3-5 times. You may also feel a bit of increase in ROM in adductors, sometimes that feels great. DO NOT use this technique if you have to great a range of motion already. In my opinion loose joints are more dangerous than tight joints. Enjoy!